Many people suffering from acne make regular appearances at medical stores to get the famous acne antibiotics. Despite the diligent treatment, most of the people finally realize the inaptitude of the antibiotics to cure acne. However, the lure of quick relief from acne can be too tempting and hence despite the many shortcomings, antibiotics continue to do a roaring business. However, before you succumb to temptation yourself, try and understand the real truth about acne antibiotics. 1. Tetracycline: People suffering from acne often resort to the use of Tetracycline, as it is so readily available in the market. This antibiotic is unsuitable for children and pregnant women. Tetracycline can also cause many side effects like headaches, nausea, dizziness etc. 2. Minocycline: Minocycline is the derivate of Tetracycline. It is less popular as it leads to many side effects including nausea, diarrhea, tooth discoloration and even skin pigmentation. 3. Clindamycin: Clindamycin oral antibiotic is prescribed widely to treat acne among other things. Clindamycin users often experience many side effects that are commonly associated with antibiotics. This medication can be especially deadly as it may lead to Pseudomembranous Colitis, a serious form of intestinal infection. 4. Doxycycline: Doxycycline is considered to be a relatively mild form of antibiotic. Even then, it can lead to dizziness and nausea, especially if it is take on an empty stomach. 5. Erythromycin: This antibiotic is very effective as it reduces redness and inflammation and even kills certain acne aggravating bacteria. However, Erythromycin cannot cure acne. It can also cause side effects like nausea and stomach upset. Do Acne Treatments with Antibiotics Work? Antibiotic medicines don't work to cure acne, but simply to subdue the symptoms like blemishes and inflammation. This is because; they merely attack and kill the acne bacteria. The acne bacteria is only the small part of the entire acne formation process. Acne is actually caused by internal factors like hormonal imbalance, toxic build up and genetic sensitivity to hormonal imbalance. These root causes are not addressed at all by antibiotics. On the contrary by killing the bacteria, the antibiotics can actually increase the complications. Killing of bacteria leads to a bacterial imbalance in the intestine. This imbalance may contribute to other diseases including Candida yeast infection. As Candida yeast infection aggravates acne, there is no possibility of getting rid of this skin ailment with the help of antibiotics. With so many limitations, people suffering from acne often discard the use of antibiotics and turn towards natural holistic approach. 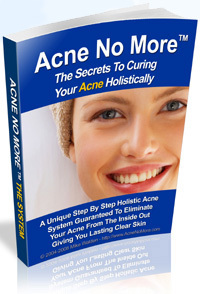 Holistic approach is effective as it works in complete contrast to acne antibiotics. Holistic approach is not a method of treatment; it is an approach of treatment that encompasses a wide range of therapies and remedies that ultimately cure acne. Holistic approach addresses the underlying cause of acne and therefore it manages to completely cure the condition. As holistic approach is natural, it has no side effects and can be used by sensitive patients including pregnant women and children. This approach also helps a person suffering from acne psychologically thereby promoting a total healing experience. Hence, effective acne treatment can have roots only in safe and efficient holistic approach.